In the liminal space, the two elements – human and archetypal – create a lush ecosystem of the dream landscape that is particular to the dreamer. 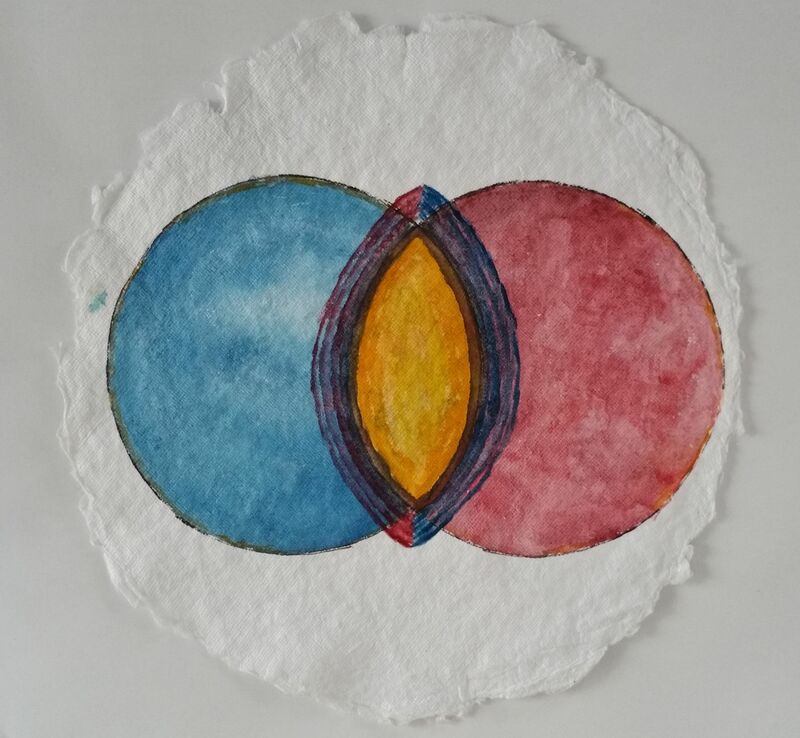 …a simple illustration of this – the image of two circles with the same radius, overlapping to form an almond space. That almond space, called mandorla, defines the liminal space between. The vesica piscis with the mandorla is an ancient symbol in many religious and cultural traditions dating back to ancient Egypt. In both Christianity and Buddhism, it has been a shape in which the divine figure is enclosed – the “halo” for Buddha, the space for Christ in the Transfiguration, any depictions of Mary and feminine saints in the Christian tradition. It goes back to the Kaballah, to Egyptian symbology. This liminal space of conversation, co-creation, fluidity between the two realms includes our dreams. Our relationship to this space includes all of how we live our inner lives – meditation, body practices like yoga, creativity, prayer, art. The dream comes to us when we are at our most unguarded, when we are not interacting in the world, when our bodies and the way we respond/react to the world are at rest. When there is no need to be interacting with the world. The dream comes to interact with us away from the world, to teach us about who we are, who we are in relationship to the world and who we are in relationship to our very soul. This is why the dreams are so rich – it is a place where the archetypal realm, the unconscious, holds court rather than our conscious minds with all of our beliefs, fears, avoidances. But how does this work in a practical way, with the dream and the dreamer? If this is the where of it – the place where the person and the archetypal realm meet – then what is the how? This place of intersection, of cross-pollination, is in each dream – the dream you had last night and the dream you had when you were a child. The particular of the liminal space for each of us is available every time we dream. Our perception may be that we do not have access to this place, that it is not present or available. But it is available to us, even when we do not remember our dreams. The dream brings that space to us, through gesture, through story and simply through dreaming itself. The vesica piscis offers a wide perspective of the work and at the same time it offers how dreams work with us in a daily, practical way. In every dream or dream cluster, we are at play in the field of the archetypal/unconscious, with the archetypal teaching and working with us through immediacy. We also come into our adult lives with a great deal of learning from our childhoods, including trauma, loss, belief systems given to us from our families of origins, belief systems about ourselves given to us from both family and our culture. Some of the legacy we receive is glorious and some of the legacy we receive is devastating. Our dreams work with us to open and heal our wounds, like a specialist working with the exact technique and medicine we need. They work with us to dispel stories we believe that are out-right lies. They work with us on how to walk our journey of manifestation and self-discovery – step by step. This is the how. How dreams create stories for us to feel. In our feeling, we find our intuition, our own particular magic and gifts. And this creates the very map we need to follow, the very map many of us have been searching for our entire lives. It is a map, however, that only becomes clear as we walk it. I once had a dream where I stood at a threshold. A simple rectangular shape, no door. On the other side was a blank space of light into which I could make out no shapes or shadows or even ground to walk on. Behind me was the life I had lived up until that moment. The only way to know what was on the other side of the threshold was to take a step through it. And to feel what I felt not knowing what I was stepping toward, which in the moment was a mixture of fear, trepidation and excitement. The how of this journey is deeply steeped in the feeling journey. The dream creates stories through which we move in order to provoke feelings inside of us. Feeling we need to feel or acknowledge. Some of the feelings we experience in dreams are feelings that move us forward and some of them are feelings that keep us stuck, frozen in amber. The dreams can help us get unstuck. Your dream offers way to move through what is frozen inside of us and what wants to blossom. In my dream, I had come to the end of part of my journey and it was time to turn away from some of my old stories, old beliefs, old ways of living. It was time to step into the unknown. Like stepping from one world to another. This is the how of it. The particular, through each step we need. Thanks Armida – would love to hear more about what touched you.